The troubles of the young are soon over; they leave no external mark. If you wound the tree in its youth the bark will quickly cover the gash; but when the tree is very old, peeling the bark off, and looking carefully, you will see the scar there still. All that is buried is not dead. nick drake (1948-1974) haunting and oddly prescient fruit tree. knowing the story of nick, all of nick's songs are haunting...ah so sad, what a loss. Good Morning Kimy! Did you have pancakes for breakfast? I like your photo of the tapped trees. 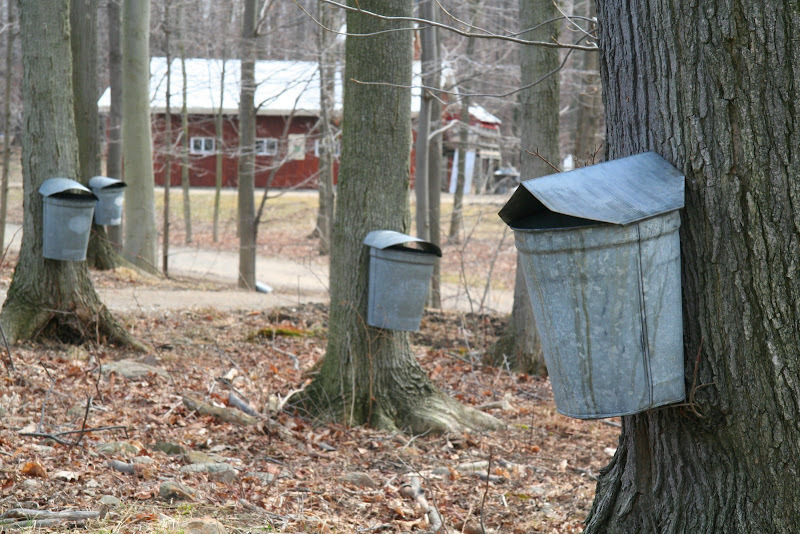 I found one I liked on Google and sent a request to use to the photographer but never heard back so I resorted to a vintage photo for my post on sugaring which represents Spring in New England, dontchaknow? love how the quote makes the photo so haunting. Thanks for the Nick Drake clip. I've always heard British musicians claim him as an influence but was never able to find any of his recordings. Stylistically he sounds a bit like Donovan, and also like the post-Genesis work of Anthony Phillips, the band's original guitarist. In fact, after reading about Drake on Wikipedia, I see that he and Phillips even shared stage fright (the main reason why Phillips left Genisis). Very interesting, indeed. What a hauntingly lovely song-- it's been years since I've listened to Nick Drake. Thanks. & the tapped trees take me back to my Vermont boyhood. When it was sugaring season up on the farm in Québec, our humongous Bouvier des Flandres, Kopeck, used to follow the teams of horses into the maple groves for a day out tapping the trees. He'd come back with an honest-to-goodness grin on his huge face. What a dog. Beautiful quote. Thanks for the link, I didn't know Olive Schreiner at all, will have to look her up. Nick Drake: sad song and sad fate. It's a conundrum, isn't it. An artist feels the need to share his work just as the tree needs to bear its fruit - even if they fall to the ground. I always feel so sad when I listen to his beautiful music. It is beautiful, all of it. Very poetic trail I followed here - first I read Steve's post about what happens after we die - or not - then I read Ronda's post about the divinity of trees, then came here. Ah, perfection! Trees are so amazing with all their growth rings and their ability to heal over a wound. if i can't have real maple syrup, i use mrs. butterworths light syrup. i'm not sure how they make it. perhaps i don't want to know. but i suspect tree scarring isn't involved. All that is buried is not dead. True. We submerg it and suppress to dull what would otherwise be the unbearable pain to a sensitive soul such as Nick.They are the ones who havwe an ageless soul that suffers quietly and unobtrusively. Man in general is so very very blighted or this suffering would never fester like it does. Never! I never heard of Nick Drake before. thank you for that- a very beautiful song. And for the great photo of the maple trees. Nick Drake is so terrific. When I first heard his music I went out and bought all four of his albums. Incredible stuff. And you're right -- the tragedy of his life lends it all an extra poignance. Yeah... It is really fine photos... on www.jciyouth.org we have often discussed it. I'm listening through earphones, and my husband is wondering why I have tears in my eyes. What a beautiful song. this makes me think of little house on the prairie. and olive shreiner! I've not thought about her for years, I had a great book (about a farm? can't remember) which I loaned to a friend and never got back.... I remember very much liking her work.